Spaniel-type dogs are thought to have originated in Spain — hence their name — many centuries ago and were probably taken to other parts of the world by the Romans or via trading ships. Before guns were invented, the spaniel was used to flush gamebirds or small animals by springing at them and driving them into the open so they could be captured by hunting hawks, coursing hounds, or nets flung over them. When firearms were invented in the 17th century, spaniels proved to be especially adept at flushing game for shooters. During the mid-19th century dogs of the same litter were classified by their hunting use rather than their breed. Smaller pups in the litter would be used to hunt woodcock, and therefore were called Cockers. Larger pups in the same litter would be used to flush game and were called Springers. Breeders then started breeding the smaller dogs only with each other and the same with the larger dogs which lead to the development of two separate breeds - the Cocker Spaniel and the Springer spaniel. The English Springer Spaniel is a medium sized compact dog. Its coat is moderately long with feathering on the legs and tail. It is a well proportioned, balanced dog with a gentle expression and a friendly wagging tail. Their talents include hunting, tracking, retrieving, watchdog, agility, competitive obedience and performing tricks. This breed is relatively inactive indoors but they do need exercise and will do best with at least an average-sized yard. They can adapt to apartment living if they are sufficiently exercised. Springers are good pets for first time dog owners but like all dogs they need early socialization and at least basic training, so they can become well rounder pets. They also need a fair amount of exercise. If you have a fenced yard or acreage Springers love to run around on their own, however, one or two daily half an hour to an hour walks are recommended. Because of their hunting instincts it is a good idea to keep them on leash when walking in unfenced areas to prevent them from hunting on their own. They also love to swim, and if you have a pool or access to a lake, it's a great way for them to get exercise. Another way to exercise them physically as well as mentally is to participate in activities such as obedience, agility, flyball, and tracking. If they don’t get adequate exercise they can become nervous and destructive. This breed is very people-oriented, and shouldn't be left home alone or isolated from people for long periods to time, they can become destructive and mischievous through boredom. English Springer Spaniels will bark if strangers come to your house, but if you're looking for a guard dog, keep looking. They are loving, gentle dogs who expect even strangers to give them attention. Before you get a Springer you need to know what type of pet you want. As stated before there are two distinct types - the field and show types - and there are differences between them. Both types need lots of exercise, but the field Springers need more than the show Springers. So if you want a companion dog purely for the purpose of having a pet, or you want to compete in shows the show-bred type will be best for you. But if you are a very active family and need a dog with lots of energy to keep up or you want to use the dog as a working dog a field-bred type will be best for you. As with all dogs the best place to get pups is from reputable breeders! Speak to the breeders and explain to them what you want out of your dog and they will be able to help you choose the correct pup for your needs. One can contact the Kennel Union Of South Africa (KUSA). They have a list of breeders who have puppies available or contact a KUSA affiliated breed club. Which other breeds are most compatible with the Springer Spaniel? Springers are great with most dogs, they can be very playful so it is a good idea to get a dog that is similar in size so they won't get hurt while playing. A good choice would be a breed with approximately the same energy level and temperament. Naturally another Springer is a good choice or any spaniel for that matter, for other breeds you can look at Labradors, Golden Retrievers, Pointers, Greyhounds, Boxers, Setter and herding dogs like Border Collies and Australian Shepherds also work well. They are a sociable breed that handles the company of other pets well, even small ones, but they might see pet birds as prey since those are what they're bred to hunt. Keep in mind that, like with all dogs, the level at which these dogs (even though they are a sociable breed) get along with other animals depends greatly of how well they were socialized as pups. Because of their affectionate nature, they aren't a one-person dog, they are very people-oriented and love spending time with their family. They enjoy the company of children and make great child companions if they were brought up with children. Older Springers who are unfamiliar with children may do best in a home with children who are mature enough to interact with them appropriately. Springers are very bright and eager to please, this makes them very easy to train. They love structured learning and are very adept in obedience and agility work. They should however be taught with gentle persistent and patience. 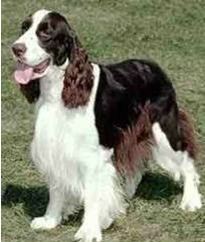 English Springer Spaniels have a double coat, which means that they shed moderately all year long. Brushing your Springer at least three times a week to avoid mats, or tangles, this will also help keep loose hair off your clothes and furniture. You can also want to trim around the head, neck, ears, tail, and feet, to give them a neater appearance. This can also be done by a professional groomer every two to three months. Other grooming requirements is to check and clean their ears weekly, because of their floppy ears the air circulation is blocked and this can cause infection; brush their teeth at least two or three times a week to remove tartar buildup and trim their nails regularly if they dont wear them down naturally. Springers are generally healthy, but like all breeds, they're prone to certain health conditions. There life expectancy is about 12-14 years. In essence, there are two varieties of English Spring Spaniel: ones intended to work in the field, and ones intended to show. Be sure you know the difference and get the type that best suits your needs. In recent years, there have been reports of English Springer Spaniels who are aggressive or overly submissive. Be sure to get your Springer from a breeder who tests his or her breeding dogs for health and temperament. Be sure to keep your English Springer Spaniel on a leash when you take him to unprotected areas. You never know when he will see a bird and be overcome by his instinct to go after it! Leave your English Springer Spaniels alone for long period of time without human companionship, they may become destructive if they're bored or lonely. Don't expect your English Springer Spaniel to be a good guard dog. They bark at noises and when strangers come around, but quickly settle down and want to be petted.